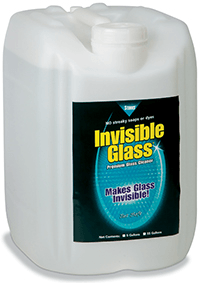 91167 Invisible Glass liquid glass cleaner makes glass so clean, you'll think its invisible. This non-caustic formula evaporates 100% and leaves no residues that streak or haze glass. Invisible Glass is guaranteed to leave no streaks or haze or your money back. You'll save time and effort because Invisible Glass contains no surfactants, soaps or foams. Other glass cleaners are made of water and suractants (soaps), which are inexpensive ingredients that remove most dirt but leave streaky, hard-to-remove residues. Invisible Glass removes all dirt and leaves no residue. Contains no caustic ammonia (high pH) or hazy (silicone) wetting agents. If you use foaming sprays or streaky blue liquids, try Invisible Glass and you'll immediately see the difference. Check out our other bulk liquid cleaners! Have you used Invisible Glass?